Dr. Ghulam Ali Khan joind his service on 1/12/1987 in Department of education as lecturer of Islamic studies. 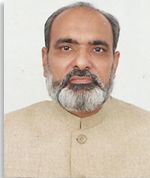 He is Professor in the Institute of Islamic Studies, University of the Punjab, Lahore since 16/4/1991. His research and teaching interests include comparative studies of the religions, Islamic social and political thoughts and Islamic research methodology. Post PhD. University of Glasgow 2007-8. PhD. (2001) University of the Punjab, Lahore, Pakistan.